On March 11, the Armed Forces’ General Command issued an update on counter-terrorism operations in the Sinai Peninsula, claiming that 46 militants were killed and another 100 were arrested. Wilayat Sinai claimed three attacks in the province of North Sinai, marking the first primary claims of responsibility from the group since February 24. Egypt’s prosecutor-general referred 11 alleged Hassm members to the State Security Emergency Court for attempting to assassinate police Major General Mustafa al-Nemr, chief of the Alexandria Security Directorate, in March 2018. Russian media reported that Egypt placed a late 2018 order for ‘over two dozen’ Su-35 Russian fighters, worth about $2 billion. A March 11 statement issued by the Egyptian Armed Forces said that 46 suspected terrorists had been killed and another 100 were arrested in north and central Sinai. The statement also reported that the military destroyed 15 suspected terrorist hideouts. The statement said that three Egyptian soldiers had been killed in combat over the unspecified reporting period. The last update from the military came in January and was the first to omit the use of Operation Sinai 2018 to refer to Egypt’s counter-terrorism efforts. This statement was presented in a similar format and also did not name a corresponding operation for the activities it described. On March 14, Wilayat Sinai claimed three attacks in the province of North Sinai. Two improvised explosive device (IED) attacks targeted an Egyptian tank near Rafah and an army patrol near the Arish airport. A third claim said that Wilayat Sinai had killed two Egyptian soldiers in clashes near Jabal Yalaq, in central Sinai. The claim did not specify whether Wilayat Sinai sustained any casualties. These claims mark the first to be issued directly from Wilayat Sinai since February 24; a March 3 IED attack had been claimed last week through the Islamic State’s al-Naba newsletter. On March 18, Wilayat Sinai claimed a rocket-propelled grenade (RPG) attack, which damaged a tank and bulldozer near Rafah. In a similar attack on March 21, Wilayat Sinai claimed responsibility for targeting an Egyptian military armored vehicle with an RPG. On March 21, Wilayat Sinai also claimed responsibility for an IED attack, which targeted a patrol near the Arish airport. The six attacks bring the total reports to just seven attacks for March 2019, representing the lowest monthly total for Wilayat Sinai since July 2018, when Wilayat Sinai claimed four attacks. 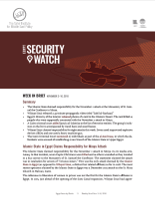 February 2019 also represented a period of decreased activity: Wilayat Sinai claimed seven attacks, despite averaging 19 attacks per month over the preceding six months. Eleven alleged Hassm members were referred to the State Security Criminal Court by Egypt’s prosecutor-general for attempting to assassinate police Major General Mustafa al-Nemr, chief of Alexandria Security Directorate, in March 2018. The prosecution asserted that the defendants killed two of Nemr’s police guards and crossing into Egypt illegally, after training in Sudan. The defendants also face charges of vandalizing public property and damaging vehicles and housing units. Few details have been published surrounding the circumstances of the suspects’ arrest or detention. After a period of quiet, Hassm claimed an operation in 2019: The group claimed responsibility for a failed IED attack in Giza in which explosives prematurely detonated when the car transporting them collided with another car. On March 18, the Russian business newspaper Kommersant reported that Egypt ordered over two dozen Russian Su-35 fighters in late 2018. The deal is estimated to be worth approximately $2 billion and deliveries are expected to begin in 2020 or 2021. In 2015, the United States completed a delivery of 20 F-16 jets, bringing the total number of F-16s in the Egyptian Air Force to 195. Egypt has also turned to France for multirole fighters, purchasing 24 Rafale aircraft in 2015. France was the largest exporter of arms to Egypt between 2013 and 2017, according to data published by the Stockholm International Peace Research Institute (SIPRI). According to SIPRI, Russia has supplied Egypt with surface-to-air missile systems, combat and transport helicopters, anti-tank missiles, MiG fighter aircraft, and a reconnaissance satellite over 16 separate transactions since 2013.